JUNEAU — Seven days after the Alaska House of Representatives began the 31st Alaska Legislature, lawmakers took their first vote on a prospective speaker of the House. The result, a 20-20 tie and defeat for Rep. David Talerico, R-Healy, is a sign that the ongoing leadership deadlock will not end soon. The nomination of Rep. Bryce Edgmon, D-Dillingham, as a competing option was withdrawn after Talerico’s appointment failed. Rep. Chris Tuck, D-Anchorage, said that despite Tuesday’s vote, he feels lawmakers are taking “very good first baby steps” toward settling their leadership question. He doesn’t know what the eventual settlement will look like. “Whether it’s a shared agreement or a caucus of the whole or a new coalition, we don’t know,” he said. Tuck, who nominated Edgmon, said he withdrew that suggestion when it became clear that another 20-20 vote would happen. Some lawmakers said that under their interpretation of the law, the nominees could then be withdrawn without a vote, fulfilling the letter of the rule, if not its spirit. Talerico said there had been discussions about that move but no agreement to do so. Tuck said there was such an agreement. 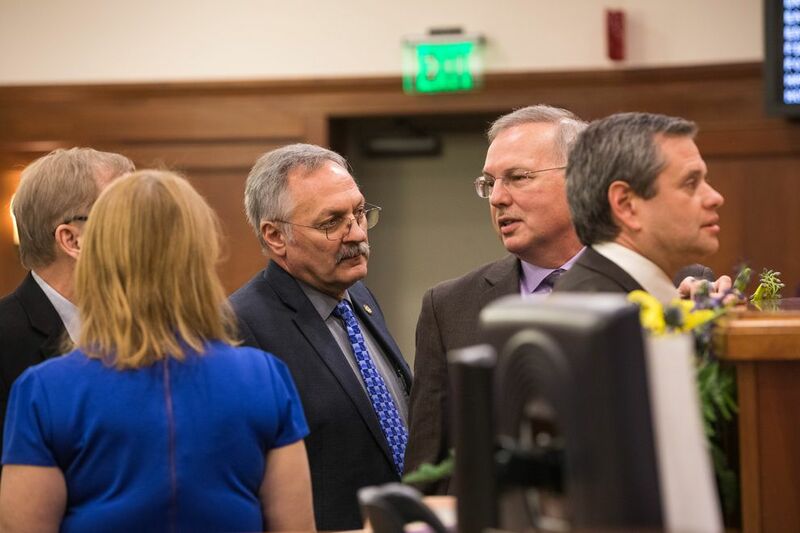 In either case, Rep. David Eastman, R-Wasilla, supported a vote and forced the issue, Tuck said. “In keeping with the spirit of the rules, I think it’s important that we nominate someone,” Eastman said after the floor session. Rep. Tammie Wilson, R-North Pole, also offered comments in favor of the vote. “I think Alaskans need to know where we’re at and that we are working hard,” she said on the floor. Twenty-one votes are needed in the 40-person House to confirm a speaker, the leader who sets the agenda in the House. Any group that controls 21 votes has the ability to advance legislation of its choice. After the November election, a group of 20 Republicans sits metaphorically on one side of the House. On the other side are 19 members of the coalition that controlled the House from 2017 through 2018. The lone remaining member is Rep. Gary Knopp, R-Kenai, who said Tuesday that he would not vote for either Talerico or Edgmon on that day. “I’m pretty steadfast in my position,” he said, explaining that he still supports efforts toward a coalition government in the House. In a separate move, the House voted unanimously to accept the governor’s request to deliver the State of the State address Tuesday night. The address will take place at 7 p.m. in the House chambers and will be broadcast online at 360north.org. In the Senate, which is unaffected by the House’s leadership deadlock, a Tuesday morning joint session of the Senate finance and state affairs committees advanced the nominations of Gov. Mike Dunleavy’s picks for commissioner of administration and commissioner of revenue. John Quick, for administration commissioner, and Bruce Tangeman, for revenue commissioner, must be confirmed by a vote of the Legislature before serving permanently. No public testimony was taken during the meeting. About 70 people, including Dunleavy, attended the annual anti-abortion Rally for Life on the steps of the Capitol at noon Tuesday. The event takes place on the anniversary of the U.S. Supreme Court’s decision on Roe v. Wade, which legalized abortion, under certain limits, in the United States. Most of the Legislature’s Republicans attended the rally, and they were joined by Sen. Donny Olson, D-Golovin.